A glyph made with glyphs, I dreamed this image and I could not take it off of my mind untill I've crafted this that you see. It's a little joke about the matrix of our creations... and now it lives in FS. Info: Created on 11th October 2010 . Last edited on 2nd February 2011. A glyph made of glyphs, I dreamed this image and I could not take it off of my mind untill I've crafted this that you see. It's a little joke about the matrix of our creations... and now it lives in FS. So meta. So very cool. The contrasting style of the large and small glyphs is very designerly. Another instance of fontstruct synchrony as I recently posted a comment on funk_king’s one-brick letter experiment discussing an elaborate version of this idea. I’m certainly not claiming to have invented the idea of glyphs built from glyphs, and I think you came up with a novel approach to the genre. Well done! @ will - that was a great idea that you offered. @elmo - this is a great execution of the idea - not that you didn't think of the same idea yourself without knowledge of what will suggested. 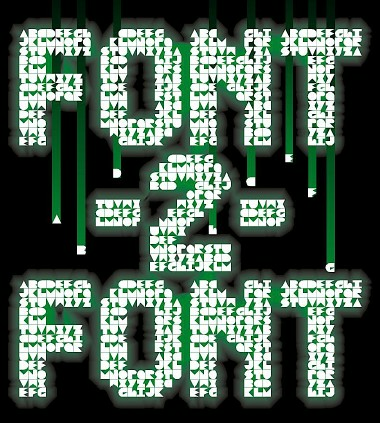 i think that is the beauty of Fontstruct and creation in general. two designer can use the same idea and come up with different results. this is fantastic. Dear friends, I did not know our posts and discussion so interesting about this theme, but since my first steps in FS I had thought about reducing the minimum size of the glyphs in a font (you can see my "zbricks eYe/FS" http://fontstruct.fontshop .com/fontstructions/show/262513), but now I see many similarities between my glyphs and those of FK, perhaps because physically there are few options to resolve the glyphs than those we have already handled. As you can see again, you go ahead and I came with a little delay. I suspected you came to this on your own, so it’s cool to know what funk_king says holds true here. An example of morphogenic fields in cultural evolution? Hahaha! :D I think we are more alike than different! Even with a typographical Neardenthal like me. I liked the coincidence, teachers. Fantastic! Really nice example as well. I've done something similar myself, http://fontstruct.com/fontstructions/show/ells_fractals_caps where each letter makes a larger one which makes a larger one. @nazlfrag: Thanks for your feedback. Convergent thinking, say those who know about it. Anyway "zinfont" is a predictable font, should have come much earlier at the FS world, IMHO. I changed the order of the little glyphs within the small ones to prevent the initial repetition at the first version of the font. I hope they have improved. @Upixel: Your words are always a very enriching for me, I learn a lot from the comments you make. Thanks again for writing to me and let me know your points of view about my works, always so exact. @ Upixel: Vos paroles sont toujours une expérience très enrichissante pour moi, j'apprends beaucoup des commentaires que vous faites. Merci encore de m'avoir écrit et de me faire connaître vos points de vue sur mes œuvres, toujours si exact. Superbe. What a nice conception. Thanks pals for your friendly comments. The font still alive, I see. Congratulations! FontStruct Staff have deemed your FontStruction worthy of special mention. “zinfont eYe/FS” is now a Top Pick. @meek: Dear FS Staff: Thanks a lot for this unexpected TP. Now Typography is running OK in very extended web places, but we must to keep the flag just right ahead, IMHO. Saludos cariñosos. Whew, what a lot of work. Amazing!!!! Thanks for sharing. I love the way you submit a sample of your fonts as the first comment. It helps to realize the possibilities. KUDOS. @macforme:Thanks a lot, my friend!